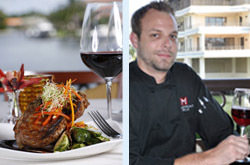 M Waterfront Grille is both a local favorite as well as a destination restaurant offering dynamic flavor profiles and polished attentive service. The award-winning comprehensive wine list showcases highly allocated vintages and large format selections. 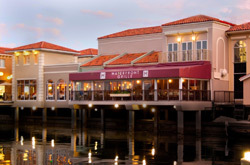 You can also purchase our Loyalty Rewards program at the best waterfront restaurant in Naples FL. With expansive Bay views, the Main Dining Room features waterfront tables and cozy, intimate booth seating. Light and spacious, it is the center of the dining venues, one of the largest waterfront dining rooms in Naples. Visit our website to learn more about the staff at M Waterfront Grille. Comfortable furnishings with both sun and shade seating, Alfresco guests enjoy bay breezes and lively marine life while dining. Public Docking is also available for guests arriving by boat at the Park Shore Marina. Perched atop Venetian Bay with three walls of glass doors that allow for Open Air dining, guests actually dine right over the water. As one of the only Private Waterfront Dining rooms in Naples, FL, the Terrace is perfect for both professional and social events. Private or semi- private reservations can be made for groups from 15-60. Corporate Conference dining, Rehearsal dinners, small Weddings, showers, Special Birthday and Anniversary celebrations and Holiday parties are regularly booked for this beautiful setting. Casually sophisticated, the M Lounge provides the perfect setting for cocktails and dining. Watch the waterfront or that important game with a cool cocktail when meeting friends and associates for Happy Hour 4 to 6pm daily. "Wine on Wednesdays" is the mid week event for experiencing new wines. Live music on selected evenings adds to the atmosphere of the M Lounge. When a special occasion arises, you need to make sure everything is perfect. Our experience staff can offer assistance with all aspects of your meeting or Special Event to help make it memorable. We offer private and semi-private dining venues for both seated events and receptions. The Terrace dining room features the best views of Venetian Bay, and is a climate controlled venue with three sides of glass doors that can be opened to enjoy the Gulf breezes. Call Maria Watson at 239.263.4421 (extension 308) to discuss your next event.